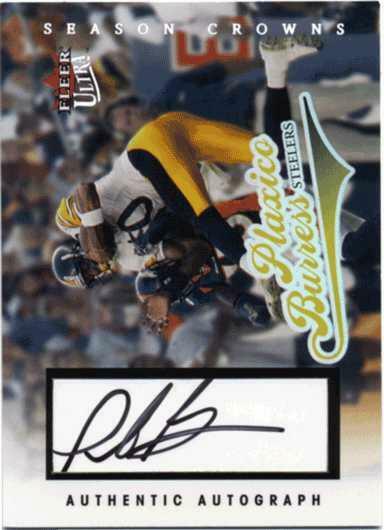 Fleer kicked off their NFL season in mid-May with the release of 2004 Fleer Ultra Football. The 232-card basic set starts with 200 veteran cards, continues with a 13-card "Lucky 13 Rookies" set featuring the top 13 collectible rookies numbered to 500 and then ends with 19 "All-Rookie" cards. Cards in the basic set feature a clean, standard front design that integrates the player's name and team in the bottom center area. The card backs also follow a standard design of player vitals and career statistics. All of the cards feature great, game-action photography. Veterans make up card numbers 1-200 in the set. The "Lucky 13 Rookies" series makes up card numbers 201-213 and includes rookie cards of Eli Manning, Philip Rivers, Roy Williams, Drew Henson, Chris Perry, Larry Fitzgerald, Rashaun Woods, Reggie Williams, Mike Williams, Kellen Winslow II, Steven Jackson, Kevin Jones and Ben Roethlisberger. Numbered to just 500 each, this limited-number series provides a great option for getting valuable rookie cards of the key new 2004 players. In addition to the "Lucky 13 Rookies" series, the "All-Rookies" series offers 19 additional rookie cards numbered from 214-232 and includes Michael Turner, Tatum Bell, Quincy Wilson, Devery Henderson, Ernest Wilford, Cody Pickett, Ryan Dinwiddie, J.P. Losman, Derrick Knight, Michael Jenkins, Greg Jones, Cedric Cobbs, Will Poole, Michael Clayton, Sean Taylor, Will Smith, Jonathan Vilma, Lee Evans and Julius Jones. An example of a "Lucky 13 Rookie" card and an "All-Rookie" card are shown below. Notice that cards in the "All-Rookies" series can be immediately spotted by the slight reddish-orange color added to the card fronts. At a total of 32 rookie cards, 2004 Fleer Ultra Football offers a nice selection of 2004 rookie cards. However, the basic set is just the beginning with this product. Gold and Platinum Medallion parallels are also available for all 232 cards. As you can see below by comparing the Basic and Gold Medallion versions of the Daunte Cullpepper card, the parallels are easy to spot with their rounded corner and tinted card fronts. In addition, each parallel card is clearly labeled as either Gold or Platinum Medallion on the card backs. So, now that you've worked on the basic and parallel sets, what about the insert, game-used and autograph selection? 2004 Fleer Ultra Football offers plenty of options for collectors interested in these cards as well. Inserts include Ultra Performers (15 cards), Rushing Kings (10 cards), Receiving Kings (10 cards), Passing Kings (10 cards) and Gridiron Producers (10 cards). Each of the Kings insert sets are also available in a Gold level version numbered to 50 which is just another of the many numbered options available with this product. The harder-to-find Gridiron Producers insert set features 10 warriors who are looking to produce yardage in 2004. A few examples of insert cards from this product are shown below. So, you want game-used and autograph cards as well? 2004 Fleer Ultra Football offers plenty of potential pulls including game-used levels of both the Ultra Performers and Gridiron Producers inserts with the UltraSwatch level being numbered to the jersey number of the player. In addition, the product features Season Crowns Game-Used, a 50-card partial parallel set with Copper (numbered to 349), Silver (numbered to 149), Gold (numbered to 99) or Platinum (numbered to 29) levels. A Season Crowns Autograph partial parallel set also exists with two levels - Regular Autograph cards numbered to 150 and Gold Autograph cards numbered to just 25. Finally, the Ultra 3 Kings set (10 cards) offers triple-swatch memorabilia cards (numbered to 33) which match up some of the greatest players at their position. All of these game-used and autograph cards combine for an overall odds of 1:12 packs or 2 cards in every box. With such a wide-varying selection of memorabilia cards, you never know what you may pull. Examples of the Season Crowns Game-Used and Autograph cards are shown below. With a MSRP of $2.99 per pack, you should expect to pay about $65 for a hobby box. Since a hobby box consists of 24 packs of 8 cards, set builders should find this to be a relatively easy set to complete. Since every box also includes 2 game-used or autograph cards, you'll have the added enjoyment of pulling quality memorabilia cards. 2004 Fleer Ultra Football is a nice product to collect, especially for those collectors looking for a traditional-looking product. For the price, 2004 Fleer Ultra Football provides an affordable option for collecting 2004 football cards, including the key new rookies. Set builders should enjoy putting together a complete set of this product while insert and memorabilia card collectors have a large number of possible nice pulls from this product. Factor in the various limited-number series and you soon see that 2004 Fleer Ultra Football offers something for every collector. Note: A small percentage of the cards reviewed had an issue with indentation and/or discoloration bands through the area showing the players' names on the card fronts (see image to the left). This issue was found on both the basic and parallel cards. 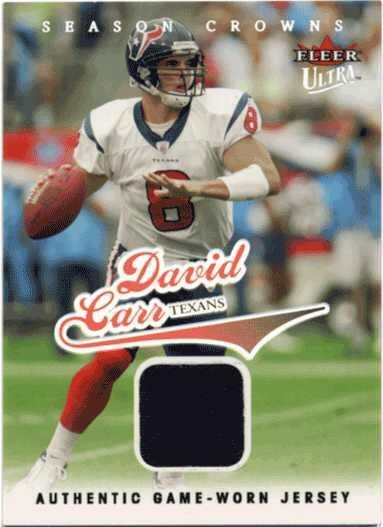 However, this small printing issue did not take away from the overall look and feel of Fleer's first 2004 football product.